Poorly installed or improperly designed gutter systems cause water to collect around your home – the opposite of what they’re supposed to do. Downspouts clog. Gutters and valleys overflow. Water pools next to the structure. Eventually, water seeps into your basement or crawlspace, saturates your yard, or leads to flooding. Since 1991, we’ve serviced all kinds of gutter systems. We’ve seen it all and done it all. We’ve also performed thousands of gutter and downspout corrections that minimize clogging, reduce maintenance & overflow, and properly channel water away from foundations. Why aren’t your gutters and downspouts working properly? Poor installation, low-quality materials, ineffective drain line design… The potential points of failure are numerous. 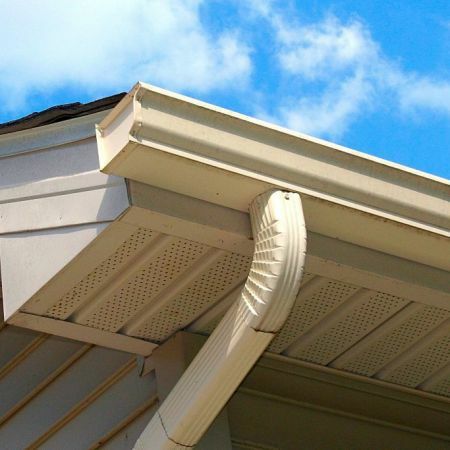 We examine your gutter and downspout system to discover the source of your problem. After identifying why your gutters and downspouts misbehave, we design a solution that fits your home. What’s in an effective solution? Sometimes, only minor corrections to existing components are needed. Corrections may include improvements to existing gutters, covers, or downspouts. As required, we also install new drain lines, new seamless gutters, or new downspouts. Honest information regarding all types of gutter covers, including their pros and cons with regard to your home. High quality gutter corrections or new seamless aluminum gutters and downspouts designed and installed by our full-time crews. All of our installers have over 10 years of full-time installation experience. When properly installed, our PVC downspout drain lines are as close to foolproof as you can get. We design drain line systems to channel stormwater to a suitable location. Drain line installation requires a lot of homework – not to mention specialized equipment! We perform all necessary utility locating, camera inspections, and even boring and tunneling.